This Yantra is especially for parent fearful about any kind of calamity striking their children and ensure a long life for them, The Yantra is said to remove Balarishta Dosha. This Dosha is a harmful astrological configuration in the horoscope, which is believed to indicate death before the age of eight. In the post below is given the simple way to perform the Balarishta Yantra Sadhana and prevent infant mortality. 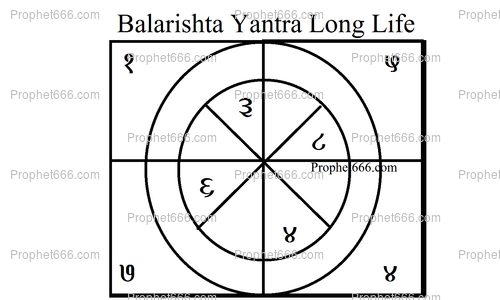 The Balarishta Yantra shown in the image should be drawn on a Bhojpatra using Saffron paste as the ink and a wooden twig as the pen. 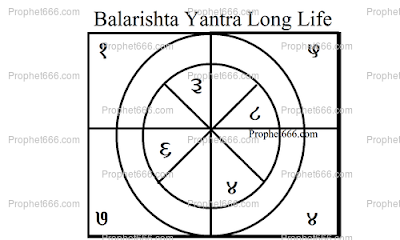 The prepared Balarishta Yantra should be worshiped duly by offering it Dhoop, Deep. Fresh Flowers and some Mithai. After this, the Balarishta Yantra should be inserted in a Metal Locket and worn by the parents of the infant as a safety talisman for the long life of their child. Note- Article written specifically to give information on Hindu Tantra Shastra and Occult practices and not to advocate the practice of the same.